Aww thanks! I’m not out of the woods yet but I’m close! You look amazing! Good for you with keeping up your regular workout routine…I’ve been such a slacker! Instead of going for a 3 mile walk around a gorgeous lake this morning I chose to eat a maple bar. No joke. I’m glad you passed the gluclose test this time! I’m thinking about skipping it all together since all you can do is focus on diet and excersise which is what your supposed to do already. Thank you! And I’m definitely not keeping up my old routine, just the schedule (3 days a week) Juat trying to stay active so it’s not too hard to get back into it after baby! You know, I thought of skipping it too… let me know what u decide. Ps. I dont have stretch marks yet and I’m just holding my breath! 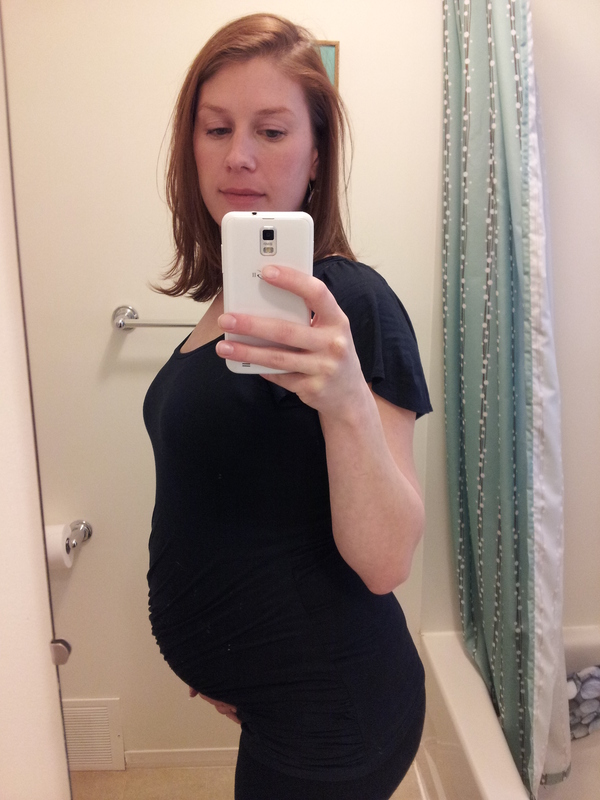 I’m only 22 weeks and I’ve already “popped” considerably and I’ve got 18 more weeks to go!!! Ohh fingers crossed we can both make it all the way without them!! I can’t clean anything that requires me to lean or squat down and a vacuum is out of the question. So I found an awesome lady to clean every two weeks. She is a GREAT price and I can’t pass it up. Cheers to 30 weeks! I’ve considered getting a cleaning lady for when after the baby is here but my dogs are too crazy! Good for u that u have one though because I’d totally do it too! I didn’t have stretch marks until a few weeks after I delivered. Weird, right? I thought I miraculously wasn’t going to get any which I couldn’t believe. Alas, they showed up late to the party. You may just luck out, though. I pretty much stopped most cleaning once I got pregnant. Mostly because my husband was paranoid about me breathing in the fumes from the cleaners – even though most of what we use is “green”. Can’t say I minded that at all. It was a shock when I finally had to go back to cleaning and emptying the kitty litter after getting a free ride for so long. Enjoy it! Oh my gosh you got them AFTER? that’s not fair at all! Such a cute bump! So happy to hear you passed the second glucose screening too. Phew! Thanks! I was very relieved too! I don’t mind if I get a few, I’m just hoping to avoid the really huge ones! You look darling and glad to hear no diabetes! Stopping by from ICLW. I, too, kept up with my workout routine until about 32 weeks. I was surprised how toned my legs were after delivery. I guess that natural extra weight was good at toning my muscles! Oh I hadn’t even thought of that, but it makes sense!! I hope I can make it a few weeks longer working out. My midwife wants me to keep it up too. I’m so happy you passed the blood glucose test, that’s a relief! I also didn’t get stretch marks until post-partum, it happened about three months after, however I think it had more to do with weight and hormone changes. I’ve heard of women keeping up with the anti-stretch mark treatments after the baby, however I didn’t as I thought I would be in the clear. I found I was the most tired in the beginning trimester and the last trimester, the middle was the sweet spot energy wise. Your body is doing so much right now! I definitely remember the physical challenges of being more rounded, enjoy it while it lasts! You look awesome! I love looking at all the bump shots. You might need to do them every other or every week as it gets closer to the end, as that’s when the baby really hits the growth spurt! I didn’t get stretch marks until I went into the hospital and swelled sooooo much prior to delivery. I had been amazed and didn’t know how that was possible with twins! Turns out I ended up with tons of them after all. Hopefully you can avoid them all together! Good job Andino for being willing to take over a few chores. It’s a practice of working together for the changes to come!